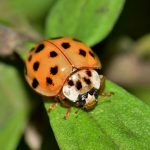 Ladybugs are also known as lady beetles or ladybird beetles, and there are about 5,000 different species of ladybugs in the world. They are adored by farmers because they eat aphids and other plant-eating pests. Ladybugs are happy in many different habitats, including grasslands, forests, cities, suburbs, and along rivers. They have colorful markings and secrete foul-tasting fluids from joints in their legs to deter predators. Birds are their primary predator but they are also prey for spiders, frogs, wasps and dragonflies. In the autumn, ladybugs seek protected places to hibernate for winter including under leaves, rocks, landscape timbers, buildings and homes. They have discovered that heated buildings are ideal for surviving the cold of winter. When the autumn sun warms the southern and western walls of buildings ladybugs are attracted to the warmth, and they crawl inside cracks and stay there for the winter. Normally this would be fine, but on warm winter days, ladybugs can wake up and enter buildings through electrical outlets or openings in walls.